The March 2011 issue of Mojo music magazine is now on news stands! 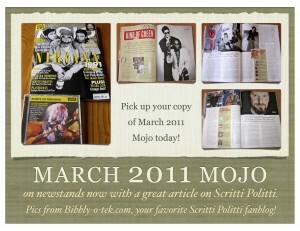 It is has great article on the history of Scritti Politti. I picked up my copy today at Barnes and Noble in near my house in Maple Grove, Minnesota! :) (Now the laweyers know where I live…remember, if any of our content is infringing, just let us know and we will stop promoting your wares. Here is a pdf. THANK YOU for the headsup! Four copies left at my local B&N. There’s a few available. On EBay. Yes, can you PLEASE scan the article for those of us who couldn’t get it! Thanks much! It is now a scan saved as PDF. It took a bit to download. Be patient, it is worth the wait. Thanks ever so much for scanning the article and making the PDF! It’s a really good read!